Organic visciole (wild cherry) fruit spread; non-sugar. 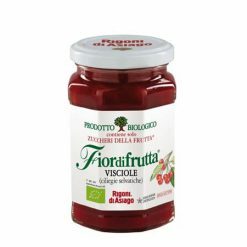 Uniquely Italian, this wild cherry fruit spread made with organic wild cherries, organic concentrated apple juice, and citrus pectin has a deliciously rich, slightly bitter taste. It is excellent spread on bread or pancakes, mixed with yogurt or warmed gently and dribbled over vanilla ice cream. A leader in Italy’s organic food movement, the company also cares about people and nature, throughout farming, processing and marketing. It provides favorable working conditions, and uses recycling and renewable energy in its operations to reduce its environmental impact.